A crystal boron silicate mineral compounded with elements such as aluminium, iron, magnesium, sodium, lithium, or potassium ((Al,Fe,Li,Mg,Mn)3(Al,Cr, Fe,V)6(BO3)3(Si,Al,B)6O18(OH,F)4), with hardness of 7 – 7.5 on Mohs scale. The name comes from the Sinhalese word “Turmali” (තුරමලි) or “Thoramalli” (තෝරමල්ලි), which means “stone with various colours”. Achroite – Very rare colourless or almost colourless tourmaline. Dravite – Yellow-brown to dark-brown magnesium tourmaline. Intense, forest-green gems are also known as “chrome tourmaline” or “chrome dravite”. Paraiba – Light-blue, blue-green, vivid blue or green copper tourmaline, named after the state in Brazil where it was found. Rubellite – Intensely coloured, red, pinkish-red or violet tourmaline. Schorl – Black iron tourmaline. Siberite – Lilac to violet-blue tourmaline, named after a deposit in the Urals. Buergerite – Iron tourmaline named after an American academic. Elbaite – Lithium tourmaline named after the island of Elba. Liddicoatite – Calcium tourmaline named after an American gemologist. Tsilaisite – Manganese tourmaline named after a place in Madagascar. Uvite – Magnesium tourmaline named after a province of Sri Lanka. Watermelon tourmaline – Bicoloured or multicoloured tourmaline that exhibits interesting pink, green and white colour zones in the same crystal. When crystals are cut in cross section, a pink core with green edges can be clearly seen. Cat’s eye tourmaline – A rare chatoyant variety of tourmaline. The chatoyancy is usually strongest in green and pink tourmaline. Tourmaline gemstones are quite tough and durable. Due to their pyro-piezoelectric properties, tourmaline gemstones do need to be wiped down frequently as they tend to attract more dust and particles than most other gemstones. To clean your tourmaline gems, simply use warm soapy water and a soft cloth. Be sure to rinse well to remove soapy residue. 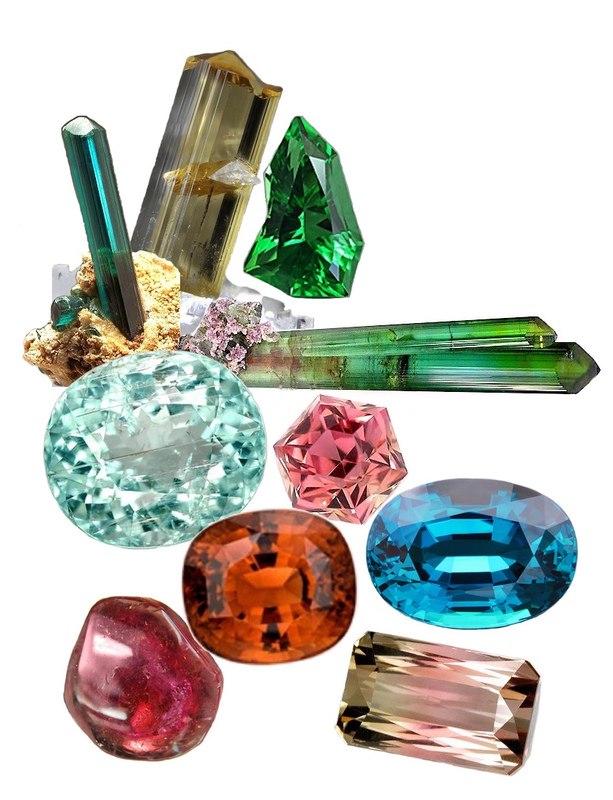 As with most gemstones, ultrasonic cleaners and steamers are not recommended. Tourmaline gemstones should not be exposed to sudden changes in temperature. Always remove any jewellery or gemstones before exercising, cleaning or engaging in harsh physical activities such as sports. Store tourmaline gemstones away from other gemstones to avoid scratches. It is best to wrap gemstones in soft cloth or place them inside a fabric-lined jewellery box.